If inspiration is to be found anywhere, it sure rests in the story of Jean Crowder Drummond, an African American woman whose path to success is nothing short of a motivational account for all of us who aspire to make it big in life. While many dwell on how much discrimination African Americans face and others complain about the various obstacles minorities encounter in their everyday life, Jean Drummond decided to take an entire different road, not asking for people’s attention and recognition, but rather by imposing herself and being an embodiment of “Be so good, they can’t help but notice.” Jean, with her purposeful determination and drive, finds gender, ethnicity and her faith as secondary factors when her “savoir faire” and her hard work is enough to make anyone stop in awe and admire how much this woman accomplished in her life! We had the pleasure to sit with Jean in Abu Dhabi and have a nice chat over her life, career, goals and aspirations. Drummond was born in a small town in Maryland. The first thing the doctor told her mom and dad is that she may not walk because she had a dislocated hip. Tough start one would say, but she remembers that anecdote with a smile. “I may not have been meant to walk, but I have been running ever since”, and run she did, along with a thriving set of siblings who all had businesses at one point in their lives. 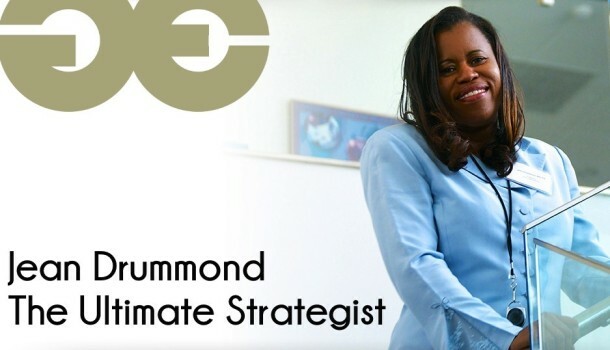 Drummond is not your usual suspect, if she sets her eyes on something, if she wants to achieve a goal, she won’t stop until she succeeds. Recalling her business, Healthcare Dynamics, International (HCDI)(www.hcdi.com) and how the idea of launching the firm popped up, we realized another surprising thing about her. “I started my company just a few months after my first son was born, but that never stopped me.” Yes, you heard that right, African American, female and a new mom. While these are all outstanding challenges only few would dare to overcome in their quest for launching a venture, the challenge made Jean all the more resolved to go through with it and officially become an entrepreneur. Jean Drummond is the ultimate definition of an entrepreneur. She encountered a social issue, spotted the opportunity and decided to do something about it. But remember, Proper Preparation Prevents Poor Performance, so before launching her startup thanks to a $400 loan from her mother to buy a laptop, Jean spent time and effort understanding the healthcare landscape and the legislative peculiarities of that industry. Basically, she did her homework! Healthcare is huge, there is a lot of money in it and HCDI is doing well in maintaining a great reputation and a trusted brand. Forging a reputable business out of ‘nothing’ is an achievement only the greatest manage to achieve, and while Steve Jobs or Howard Shultz may have been business visionaries, Jean is taking that notion to the next level thanks to her unmatched determination and her ability to overcome challenges of all nature. In today’s competitive world, being good is the new average, being great is the new good and to get noticed you have no choice but to become the best at what you do. Jean Drummond walked us through some of the inner workings of HCDI and what made her firm exceptional. Jean’s work is her passion, what she is most excited about. To put it in her own words, “that’s what God created me to do.” But Jean’s exceptional track record and striking personality has a lot more hiding behind the scene. Because of her entrepreneurial background, Jean finds great pleasure in sitting with young entrepreneurs and driven people in order to see how she can be of help and use her experience to benefit others walking down the entrepreneurial road of discovery. In addition, Jean launched a foundation called the Institute for Creative Community Initiatives (www.iccinititiative.org) that focuses on at risk boys and girls to help young people build self esteem. The nice and rosy accomplishments one might see didn’t come without her share of hardships. Reflecting back on the difficult times she went through, Jean gave us insight on the challenges she faced and how many times she was told to give up. “People ask me how I have made it through the tough times. I reply that there is no gain without some pain. You have to learn to make lemonade out of lemons. Every obstacle presents a new opportunity. So when you fall, just get back up and stay on course. You must remember a every harvest requires both the storm and the sun. Be patient, persistent, prepared and remember to pray. Some days you just ask yourself, why me? Instead I say, why not me? Do not give up even in the most difficult moments. Retool, Recharge and Redefine your way. Being a female African American didn’t make it easy for me. People told me you can’t, others told me I am not good enough, but hey, I am here today! These potential liabilities became my most powerful assets”. In addition to Jean’s faith, critical to her success is love for her family. Her husband for 28 years and three sons represent a testament to her inspiration and priority as wife, mother then entrepreneur. Keeping these relationships in perspective has been vital. Her extended family and friends have been a reservoir for inspiration and continued strength. The journey Jean Drummond undertook is admirable and inspiring to many out there, the perseverance, the passion and the drive to stop at nothing should be a reference for young people today who strive to succeed. Success requires sweat, blood and tears. It isn’t easy and it’s not something to take for granted. You don’t need to be perfect; you don’t need to know everything or be a genius, you just really need the determination to work hard towards your goals. But hey, you don’t need to listen to any of this from me, just hear what Jean has to share with every young entrepreneur out there working to achieve greatness. All of us sometimes fall short. When you do, simply use the experience as a teachable moment to improve and move forward. “I am not perfect, but what I do, I do well. My work has evolved through many successful and challenging days. A key critical component to success is balance. You must establish time for God, family, friends, self and work. Living a healthy lifestyle of eating well, exercising, retooling and reinvesting in yourself support long term success. Warren Buffett once said that he’s so successful because he’s competing against only half of the world. Well, Buffett obviously didn’t have the chance to meet Jean Drummond, because she is the kind of women who will take on Bill Gates, Buffett and Richard Branson and change the rules of the game. Passionate, ambitious, tenacious, goal driven and focused, Jean is the ultimate definition of a new term “fem-treneur”. Jean is the type of role model everyone, girls and boys, should be looking up to and learning from.